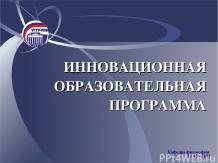 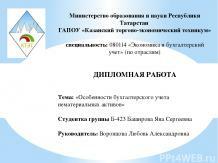 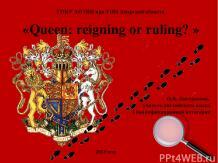 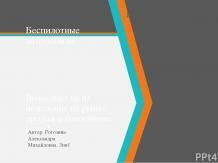 ПРЕЗЕНТАЦИЯ ПО АНГЛИЙСКОМУ ЯЗЫКУ 5 КЛАСС " SHOPPING"
Главная / Английский язык / Презентация по английскому языку на тему"Санкт-ПЕ=етербург"
Презентация на тему: Презентация по английскому языку на тему"Санкт-ПЕ=етербург"
PROJECT “THE BEST OF ALL POSSIBLE WORLDS. 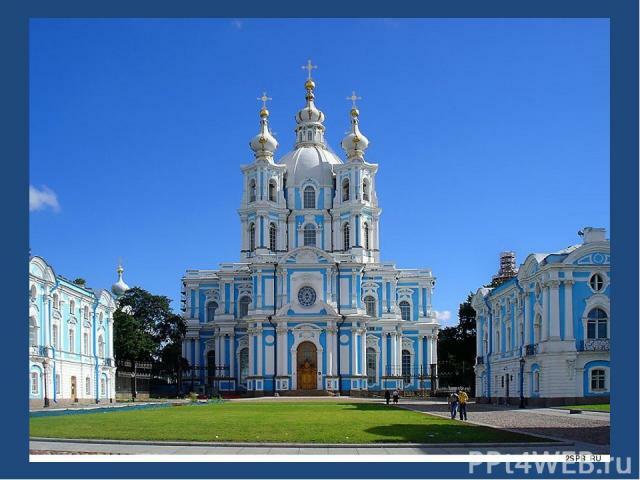 ST.PETERSBURG” Выполнил: Бутурлакина Ж. 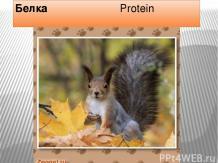 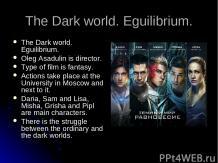 10 класс Учитель: Романовская С.И. 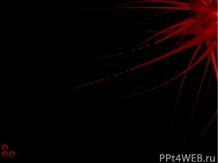 To the southwest of the city stands the Izhora Hills. 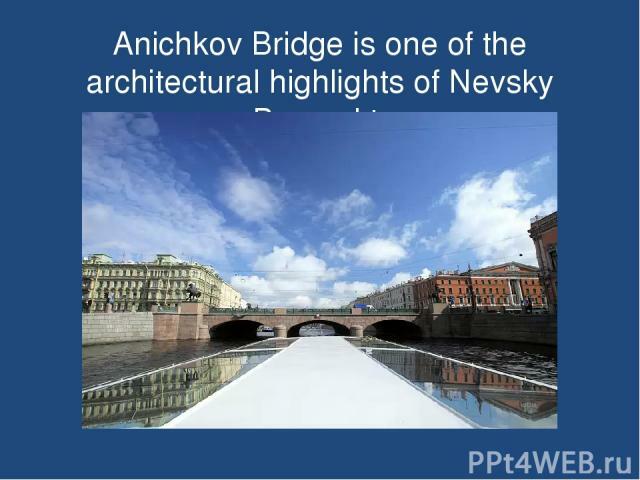 To the north of Primorsky Vuoksinskie Ozerny area. 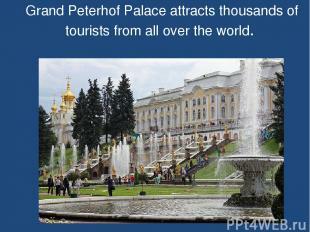 These places are picturesque at any time of the year and attract a lot of tourists. 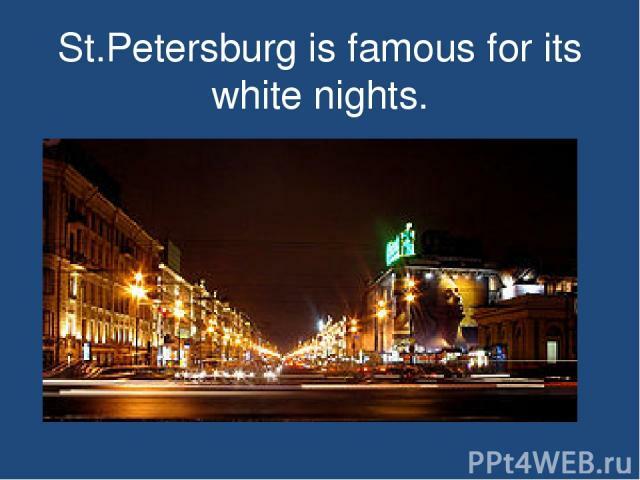 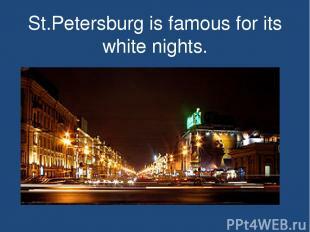 St.Petersburg is famous for its white nights. 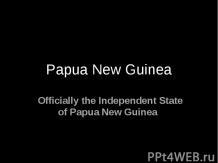 Different festivals take place at this time. 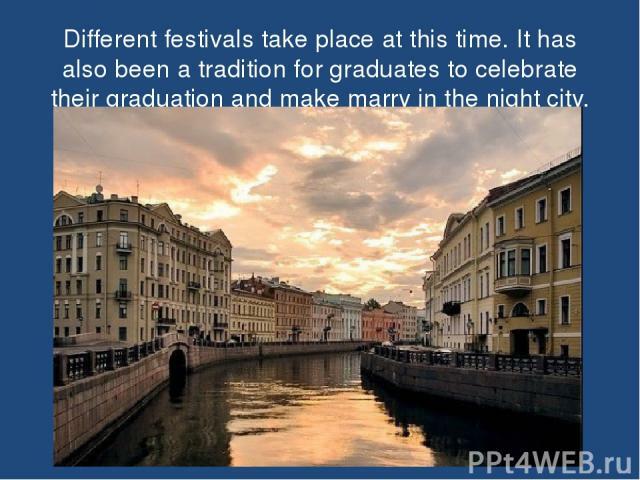 It has also been a tradition for graduates to celebrate their graduation and make marry in the night city. St. Petersburg is a cultural centre. 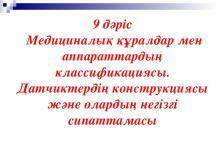 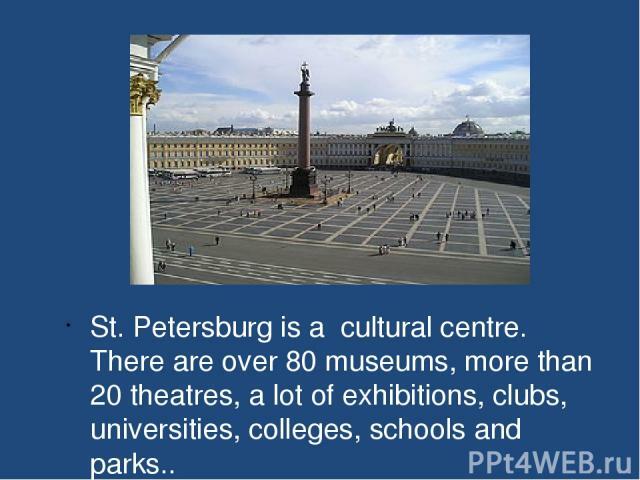 There are over 80 museums, more than 20 theatres, a lot of exhibitions, clubs, universities, colleges, schools and parks.. The weather is not very good here. 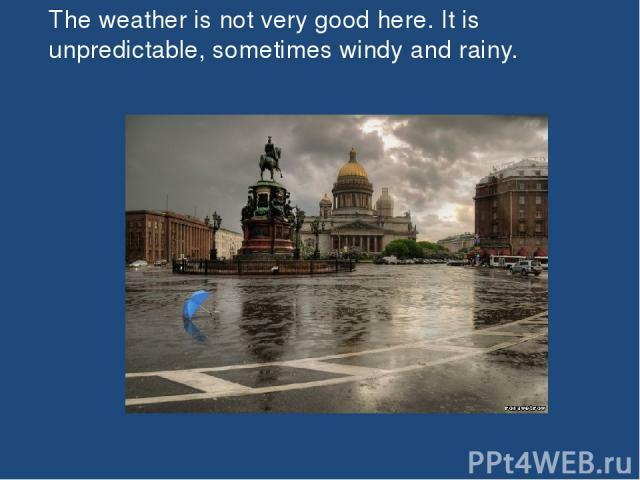 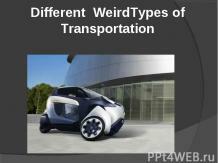 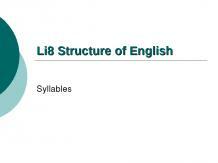 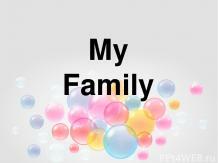 It is unpredictable, sometimes windy and rainy. 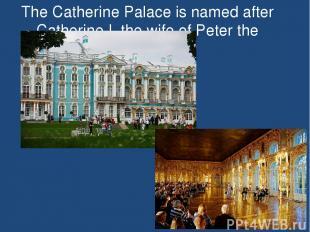 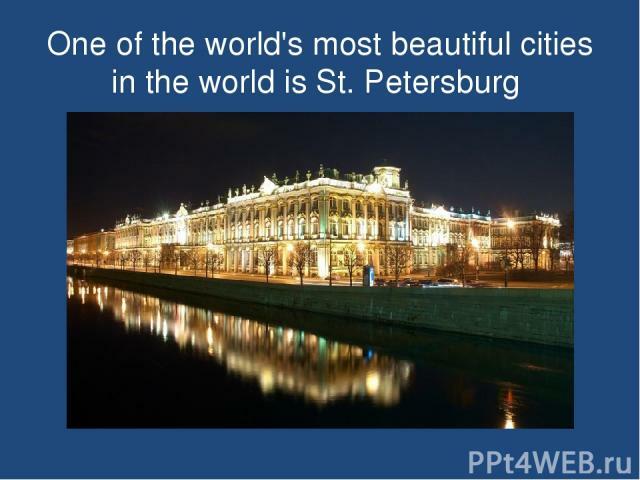 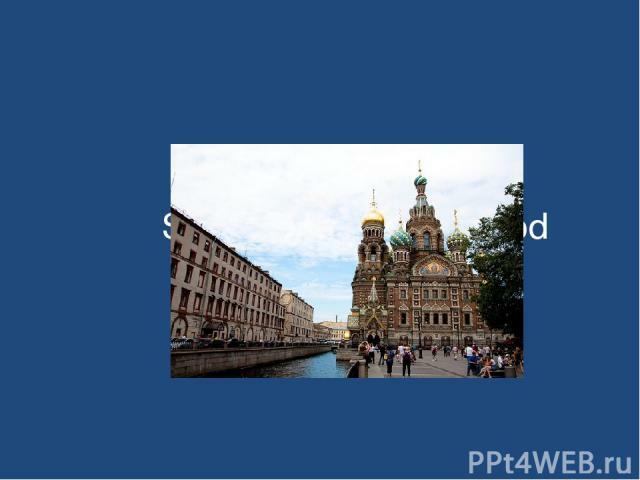 St.Petersburg is very famous for its places of interest. 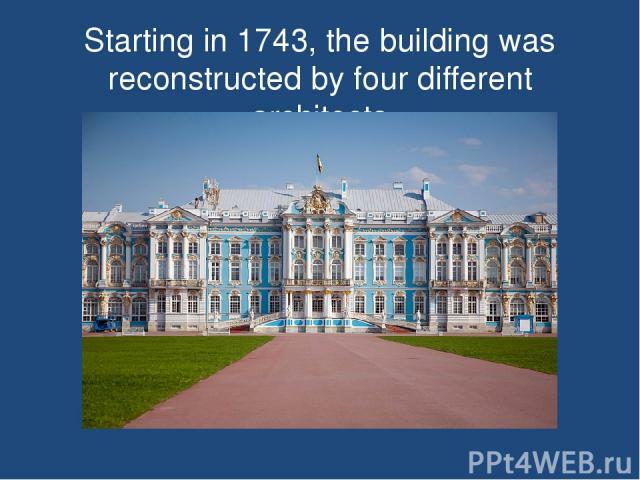 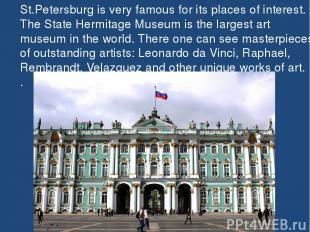 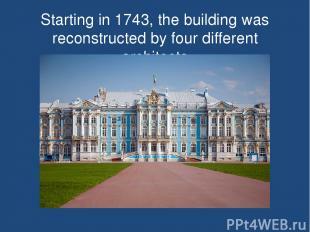 The State Hermitage Museum is the largest art museum in the world. 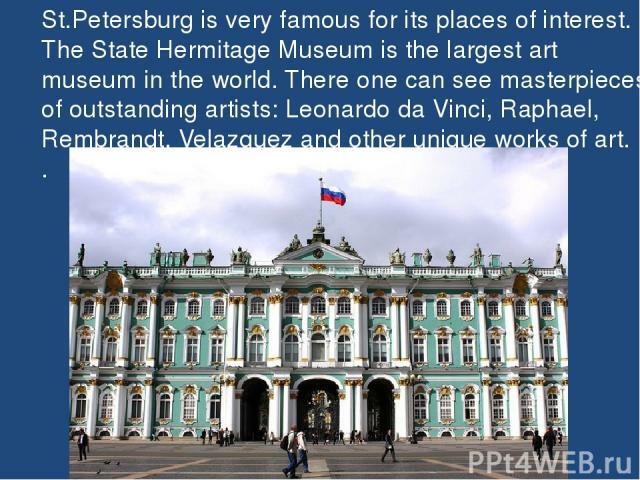 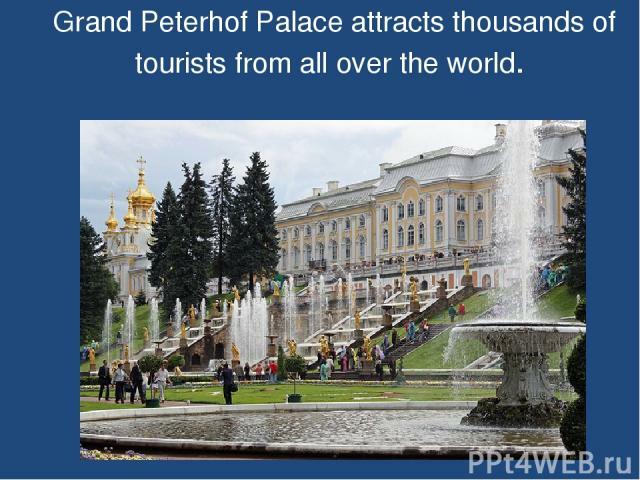 There one can see masterpieces of outstanding artists: Leonardo da Vinci, Raphael, Rembrandt, Velazquez and other unique works of art. .
Grand Peterhof Palace attracts thousands of tourists from all over the world. 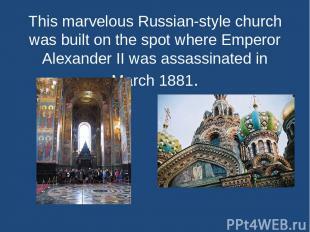 This marvelous Russian-style church was built on the spot where Emperor Alexander II was assassinated in March 1881. 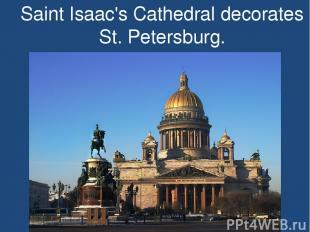 Saint Isaac's Cathedral decorates St. Petersburg. 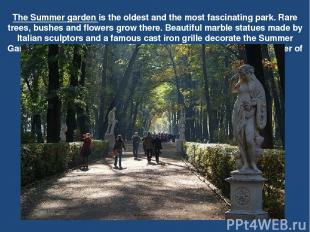 The Summer garden is the oldest and the most fascinating park. 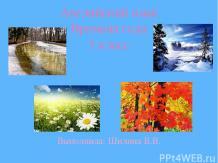 Rare trees, bushes and flowers grow there. Beautiful marble statues made by Italian sculptors and a famous cast iron grille decorate the Summer Garden. 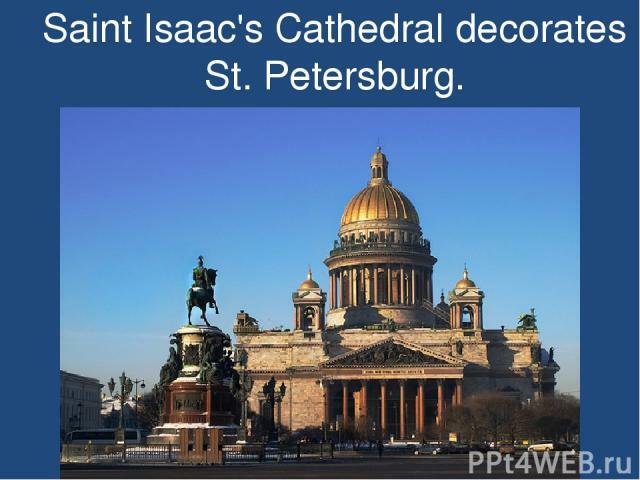 There is a bronze monument to the prominent Russian writer of fables Ivan Krylov (by sculptor Klodt) in the Summer Garden. It was in Saint Petersburg that the tradition to number streets appeared. 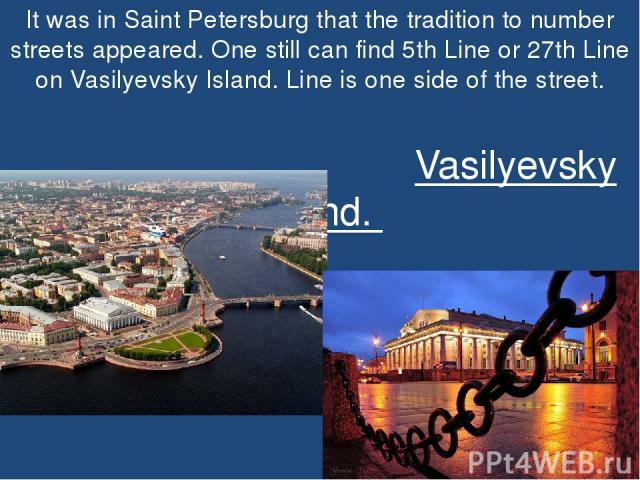 One still can find 5th Line or 27th Line on Vasilyevsky Island. 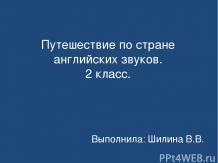 Line is one side of the street. Vasilyevsky Island. 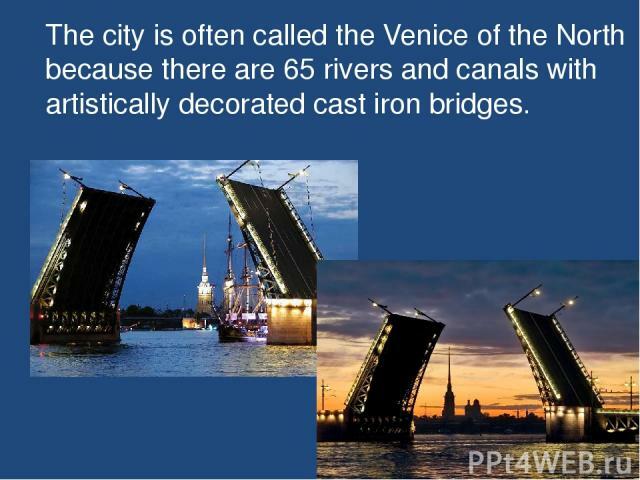 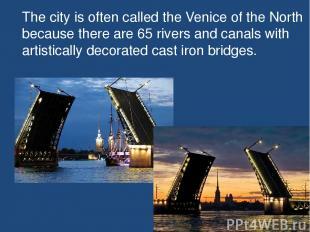 The city is often called the Venice of the North because there are 65 rivers and canals with artistically decorated cast iron bridges. Anichkov Bridge is one of the architectural highlights of Nevsky Prospekt. 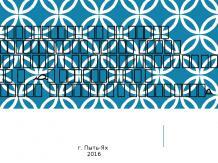 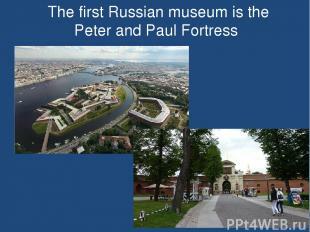 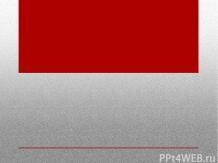 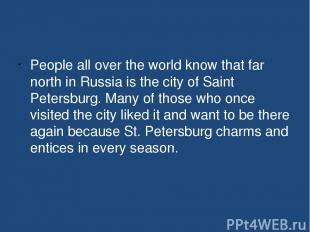 People all over the world know that far north in Russia is the city of Saint Petersburg. 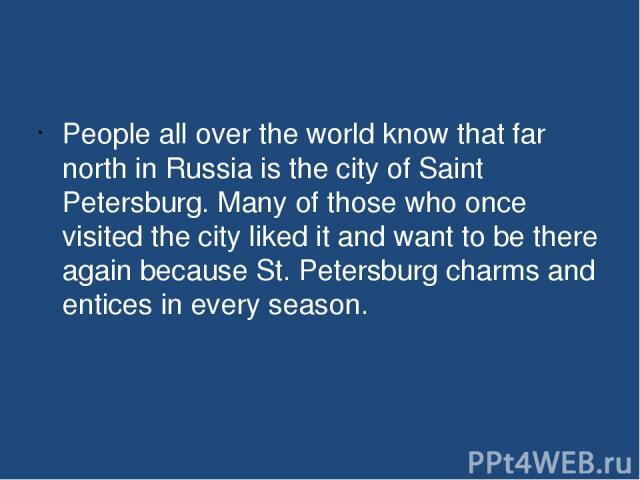 Many of those who once visited the city liked it and want to be there again because St. Petersburg charms and entices in every season.